Welcome to our subscribers (new and old)! OK, gang, how's it going so far? It's been 19 days. If you started a new habit (or tried to drop an old one!) at the beginning of the year, you've almost reached the 21-day mark for your new habit. Yay! Whether your new habit is writing every day or even writing only once a week, I'm so excited for you. I didn't tackle a new habit on January 1st. I know how crazy it gets in January with Organized Writer so I'm holding off until February. If you are feeling a bit overwhelmed by everything you are trying to accomplish, know you are not alone. Take two minutes to reassess where you are going. Do you need to tweak anything? I made some adjustments to my time map this week, and it was a much smoother week. 1. Finish at least one new book. 2. Have regular teleseminars for writers. 3. Launch two new web sites. 4. Launch one new service through Organized Writer. 5. Increase my consulting practice. 6. Spend my time on the 20% activities that give me 80% results. 7. Keep the house cleaner (even if I have to hire a housekeeper!). 8. Do more fun things with the kids. 10. Improve the clothing flow around my house (I'll explain next week)! Welcome to the middle of the 30-day Write More in 2004™ plan. Don't Forget - Tuesday TeleSeminars! Jan 27 - Publishing without Paper from Julie Hood. This presentation will explain why every author needs an ebook, how to create one and what you need to do to sell more ebooks. Sign up today at Publishing without Paper. ==> Freelancers: Clips, Submissions, and Queries. Oh, my! ==> Show me the money! How well do you keep track of your clips? 2. Next, dash to the copy center, and make copies of some of your best clips you plan to use this year. 4. Then update your web site with the most current clips (get permission first, of course). 5. 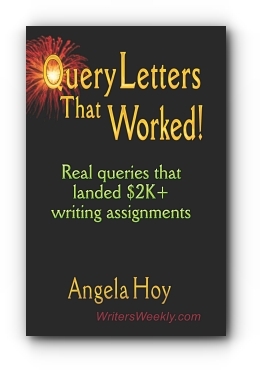 Check out Angela Hoy's latest book, Query Letters That Worked! Real queries that landed $2K+ writing assignments. The book lets you peek into the files of some of the best freelancers on the planet. You get 25 queries and proposals and six general pitch letters plus tons of good advice. Each letter is carefully analyzed for what makes it work (since you can't actually copy the queries in this book, you can use the concepts to improve your queries). You learn about how the article progressed from idea to published article, and each writer's background is listed with links to their web sites. You also get Angela's secret to finding steady freelance work, tips for phone queries, and the six golden rules of queries and submissions (and how to break them). This book is chock full of advice on how to improve your queries -- it's a definite must-have for freelancers. BOOK: Day 19. Acrobat, Ctrl+N, p. 118 Paper, p. 112. ___ 1. Make new planner forms. ___ 2. Get copies made. ___ 3. Get literature organizer. ___ 4. Update web site. ___ 5. Read Query Letters that Worked! Spend less time waiting in line at the post office. 3. Order stamps for a small service charge at 1-800-STAMP24. instead of standing in line at the post office! BOOK: Day 20. Acrobat, Ctrl+N, p. 121. Paper p. 115. 1. Create a Query Template. ____ 1. Get personalized envelopes. ____ 2. Get a post scale. ____ 3. Add postage calculators to your list of online favorites. ____ 4. Create a Query Template and print the Query Checklists. How professional are your email queries? 1. Using a cryptic email address like kooa1b3@juno.net. If you do use an email address like this, check your email program to see how you set the From name so your first and last names appear. 2. Using a family email address so your business queries come from TimMichelleS@msn.com. Get a separate email address for your writing business. 3. Using ineffective subject lines. Make your subject lines thoroughly describe what you are sending. 4. Missing contact info. Include ALL your contact information, including your regular address, your phone number, and web address. Automate using the signature part of your email. BOOK:Day 21. Acrobat, Ctrl+N, page 127. Paper, page 121. 1. Create your Query Cheat File. 2. Create a Query Template. ____ 1. Improve your email queries with list above. ____ 2. Make a query cheat file. ____ 3. Make a query template. When did you contact that editor? What did you send them? details are listed on the Submission Tracker form. BOOK: Day 22. Acrobat, Ctrl+N, page 130. Paper, page 124. 2. Find out what a tickler is and how to set it up. ___ 1. Determine how you will track your submissions. ___ 2. Set up your tickler system. 2. Select the Spelling and Grammar tab. 3. Select "Show readability statistics" at the bottom. statistics should be listed at the bottom. If these instructions do not work for your version of Word, go to help and search for "readability". BOOK: Day 23. Acrobat p. 134, Paper p. 128. 1. Print a proofreading checklist for each manuscript. 2. 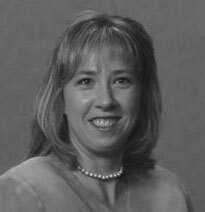 Learn how to create a manuscript template. 3. Find out what you should do to keep an editor happy. ____ 1. Check your manuscripts for readability. ____ 2. Register any copyrights. ____ 3. Print proofreading checklists. I prefer electronic and bought Quicken Home and Business because it can send customized invoices. Amazon has a $30 rebate if you purchase TurboTax, too. then find the paper in that month. your receipts, bill and statements. to deal with all these accounting tasks. __ Reconcile credit card statement. the income level you want. Don't forget your taxes! BOOK: Day 24. Acrobat, Ctrl+N, p. 140. Paper, p. 134.
to do the accounting for your writing business. 2. Learn how to send professional invoices. 3. Determine what you need to track for taxes. ____ 1. Set up your accounting system. ____ 2. Create your 12-months of folders. ____ 3. Create your spending plan for the year. ____ 4. Complete monthly accounting tasks. is accounting and taxes, and I'll repeat the popular one-week plan to finish your taxes. getting lots of tax documents in the mail this month. never remember to write stuff down in the car. the end of the year, I just add up all the visits. kind of records you need. ___ Do you need to pay quarterly sales tax? Mine are due by the end of this month. ___ If you or your spouse have "regular" jobs, do you need to make any changes to your W-4 for 2004? ___ Review your calendar, and update your mileage log. BOOK:Days 25 and 26. Acrobat, Ctrl+N, p.144. Paper, p. 138.
deduction, home office deductions, and car expenses. and/or make estimated tax payments. 5. Review the year-round tax planning calendar. ___ 1. Set up a folder for all your tax info, if you haven't done it. ___ 2. Set up a system to track your mileage. ___ 3. Complete January tax tasks. The new 2004 Writer's Calendar is now available!